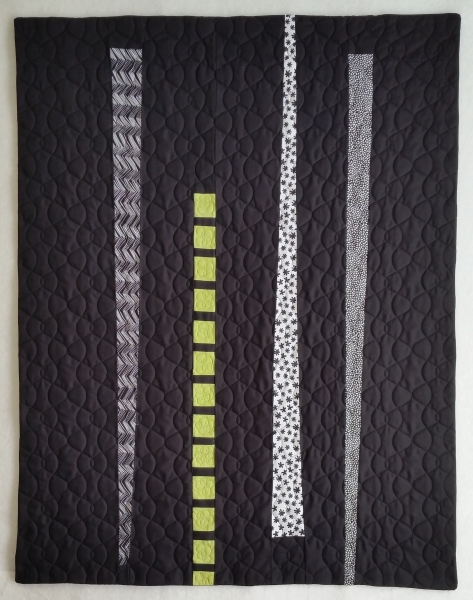 When Your Quilt Travels to Australia without You…. 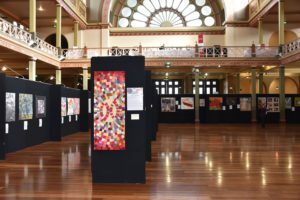 So my quilt Chopsticks and Edamame has been travelling the world without me since it was accepted into Studio Art Quilt Associates Food for Thought show. It was in Dublin and the UK last fall, and is spending the spring at 3 venues in Australia. 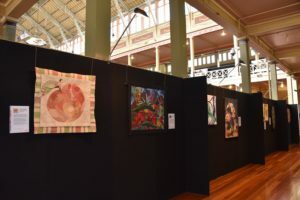 This morning my email inbox contained some photos of a spectacular venue, the Australasian Quilt Convention in Melbourne (yeah, I didn’t know there was such a thing, either). 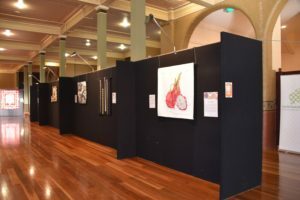 The 2016 Australasian Quilt Festival venue for SAQA’s Food for Thought exhibition. My quilt is in the center of the top photo below. Unfortunately, the black background didn’t do much for it, I am afraid. Chopsticks and Edamame will be in Michigan at the Gerald Ford Presidential Library this summer, and I am excited to be able to check it out there. I will have my posse with me. It is not often that my parents get to see my work, so that will be cool. I’m not at all surprised your work is touring. The top piece is beautiful, black background or no. Nice going, Mary! Thanks, Caroline! Let’s say we do a roadtrip! I hope I am as well-traveled as this quilt is, someday, Peggie!